The story, filled with racial and social obstructions, and rather than warming your heart, grabs it and twists it into a Gordian knot. The story, filled with racial and social obstructions, is serious to the point of sadness and rather than warming your heart, grabs it and twists it into a Gordian knot. 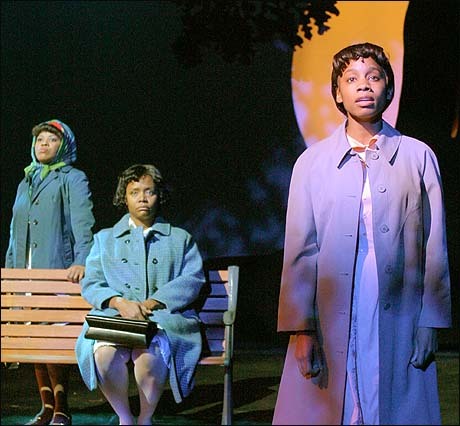 There is a lot of anger vented through music in “Caroline, or Change,”; the nearly sung-through musical by Tony Award-winner Tony Kushner (book and lyrics) and Jeanine Tesori (music). Operatic in its aspirations and dramatic in its presentation, this unusual musical made enough friends and supporters during its successful run earlier this season Off-Broadway to justify a move to Broadway. The production fits as snugly into the Eugene O’Neill Theater as it did at the Public Theater. A second visit confirms its major pleasures more than its minor flaws. If anything, the performances are all a bit sharper. The score also sounds richer. The story, filled with racial and social obstructions, is serious to the point of sadness and rather than warming your heart, grabs it and twists it into a Gordian knot. With that said, it is also filled with greatness. The musical’s most original device is the use of a washing machine, clothes dryer, a radio, an old bus, and even a moon that sing. These anthropomorphic characters (a bow, undoubtedly, to illustrator Maurice Sendak with whom Kushner collaborated with on a children’s book “Brundibar,” and ” The Art of Maurice Sendak”), fit cleverly into the musical’s fierce and fanciful reality. At times they are used to enhance and brighten a world that is suddenly filled with unsettling and even tragic events. They also serve to rev up the musical’s autobiographical and political engine driven in equal parts by Noah Gellman (Harrison Chad) a Jewish boy growing up in Lake Charles, Louisiana during the early 1960s and the title character Caroline (Tonya Pinkins), his family’s black maid. Pinkins is brilliant and unforgettable as the opinionated day-worker caught between her own personal bitterness and the increasing-in-intensity racial turmoil and changes happening around her. Caroline is also caught between the changes she sees in her closest friend, her children, as well as in the family she works for. Under George C. Wolfe’s sensitive direction, Kushner’s artfully compacted 2 ½ hour tome (that is, comparing it to the 7 hours of ” Angels in America,” and the 4 hours of “Homebody/Kabul”) emerges not only as a thoughtful and unsettling examination of the boy and the maid’s increasingly volatile relationship, but of the endangered feelings and views of their world’s apart families. Above all is the change that threatens the uneasy bond between Carolyn and Noah and has existed ever since Noah’s father, Stuart (David Costabile), remarried following the death of his wife from cancer. Unknown to his nervous-to-a-fault step-mother Rose (Veanne Cox), who tries but does not seem to know how to reach the boy, is that Noah’s most guilty secret pleasure is getting to light Caroline’s cigarette, as she attends to the laundry in the basement. Noah’s habit of leaving change in his pockets leads Rose to punish him by letting Caroline keep it. Although the change, mostly quarters, means a lot to Caroline, especially feeding her three children on her salary of $30 a week, it creates a rift between her and Noah, further aggravated by her finding a misplaced $20 bill. The quality of the acting and the singing by a large company is notable. The sheer force of Pinkins’ intensity as a 39 year-old divorcee with a son fighting in Viet Nam, propels her outstanding performance both vocally and dramatically. Although the Gellman family is shown as sympathetic, for obvious reasons, with the social equality and changes that African-Americans are seeking, they are also fearful of change, not surprisingly following the assassination of the President Kennedy. If the most visionary symbol is the moon (rapturously sung by the gauze-enveloped Adriane Lenox, the more whimsically-coded radio takes the form of a Supremes-like group in the persons of Tracy Nicole Chapman, Marva Hicks and Ramona Keller. Capathia Jenkins and Chuck Cooper give a bright human resonance to their comic roles as washer and dryer, respectively. Cooper’ s bass voice is heard again, as the rickety old bus for black people. The bright mobile settings by Ricardo Hernandez expand and contract to create both expansive and intimate spaces as the play, enhanced by Jules Fisher and Peggy Eisenhauer’s lighting, moves fluidly from the basement to the living room to the out-of-doors and even into dreams. Paul Tazwell costumes have the opportunity to be true to the period as well as take their flights of fancy. Although the program does not include a song list, Tesori’s expansive score is melodic, vibrant and eclectic, ranging from neo-operatic to R & B to Klezmer. It far outshines her contributions for “Thoroughly Modern Millie.” The orchestrations (the work of Rick Bassett, Joseph Joubert, and Buryl Red) and the musical direction of Linda Twine, enable every word of the libretto to come through clearly. As a bold new musical, “Caroline, or Change” doesn’t offer its characters solutions, but only the lesson to except change when it comes and run with it with no regrets. An emotionally rich portrait of a father and son using 1960’s musical genres. Joanna Settle does a remarkable job molding what might have become a disorganized—but wonderful—mess into a satisfying whole, honoring both the actors and the material.